Choose from several books and seminars on DVDs created by Decker Communications to help you be more effective in leadership and communication. There’s no such thing as private speaking. 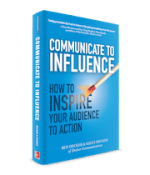 From the boardroom to the water cooler, from voicemail to video chat, even at backyard barbecues and soccer practice, you have the opportunity to influence and inspire action. Every. Time. You. Speak. Sure, in business and in life, people check off an action item because they have to. But what if they were so moved that they wanted to do it? You must earn the license to lead. Not by expertise, authority or title alone, but by influence. Bert Decker’s Best Seller Revised and Updated! Now, the complete book of speaking. In this revised and updated edition of his bestselling book, he distills his expertise into a fresh new approach to speaking, with examples and how-to exercises that anyone can follow. Decker rounds out the behavioral focus of the first edition to include his powerful tool to organize content. Now you can learn to create focused, listener-based messages in half the time. Spend a few evenings with this complete book of speaking, and you will discover how to win the emotional trust of others—the true basis of communicating in any situation. One hour of live seminar excerpts with Bert Decker and the famous Decker Method effective communicating techniques. What counts in establishing trust and believability? (Paperback) Learn to use and master the famed Decker Grid™ system, a methodology for organizing your presentation message. How to always have a focused message. One hour of the basics of using The Decker Grid™ system for content preparation with Bert Decker. Learn to recognize conscious and unconscious cues to increase your effectiveness as a communicator and leader. Understand the six skills of the leader. This practical workbook format provides tools to guide you through the nine behavioral skills for effective communication. You’ll find several worksheets throughout to help you develop an action plan for further improvement. With practice, you can raise your communication skill into an art form. Prepare for every communication experience with Decker Grid Folders. These 8 1/2″ x 11” folders are made of strong cardstock. Inside you’ll find the Preparation Triangle and Presentation Grid to help you create a focused, listener-based message every time.